Summary: How might teachers motivate students who identify as “non-readers” to find purpose in reading? 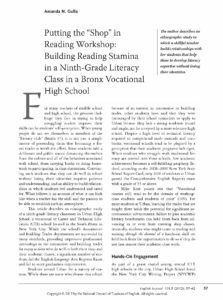 In this article, Amanda Gulla, a teacher consultant with the New York City Writing project, offers a portrait of the ways in which co-teachers orchestrated an independent, reading-workshop model classroom for their urban CTE (career and technical education) students who developed fluency and agency as readers. Teachers planning and leading professional development, study groups and classroom teachers interested in exploring solutions to the challenges of reading instruction will find inspiration in this easy-to-read ethnographic study. As part of a grant shared among several CTE high schools in the city, Urban High School hired the New York City Writing Project (NYCWP) to conduct onsite professional development in the school. NYCWP sent me as a teacher-consultant to work with teachers and form a professional development study group. During the course of facilitating the study group I got to know the participating teachers and visited their classrooms along with several others. In the study group we discussed the challenges of providing the structure and support some students need to engage with texts in a more than perfunctory manner, to be willing to stay with reading materials that may not be easily accessible. We also analyzed some of the technical texts students had to read for their shop classes in an effort to grasp what it was that allowed the adolescents to work with these highly technical textbooks, and why there seemed to be so little carry-over of these skills into their academic subjects. One of the English language arts teachers in the group, Jennifer, invited me to visit her classroom. After observing her teach several classes, I began to notice that she seemed to have set up her classroom to allow students to approach their work in her class using some of the same rituals and strategies as they do in their shop classes. Students move freely about the room with a sense of purpose. They select their own books and read independently, responding in their notebooks and sharing their responses with the teacher or with a peer. They know where to find the materials they need for the task at hand, and they do so efficiently. Such a productive atmosphere requires a great deal of planning and classroom community building. When she told me that all the students in the class were ninth graders who had entered the school having achieved the lowest possible score (level one) on the eighth-grade ELA exam, it became clear that this teacher had mastered valuable strategies that could be shared with colleagues. Copyright © 2012 National Council of Teachers of English. Reprinted with Permission.